What is Simple Suburban Living? Homesteadin'. Green living'. Animal lovin'. Square foot farmin'. Tree huggin'. Followin' Jesus. That's Simple Suburban Livin'. 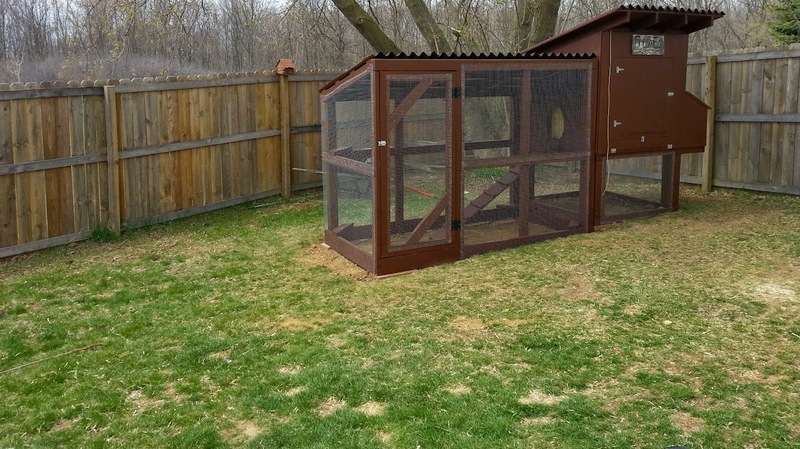 Our little homestead grew with the addition of chickens this year. 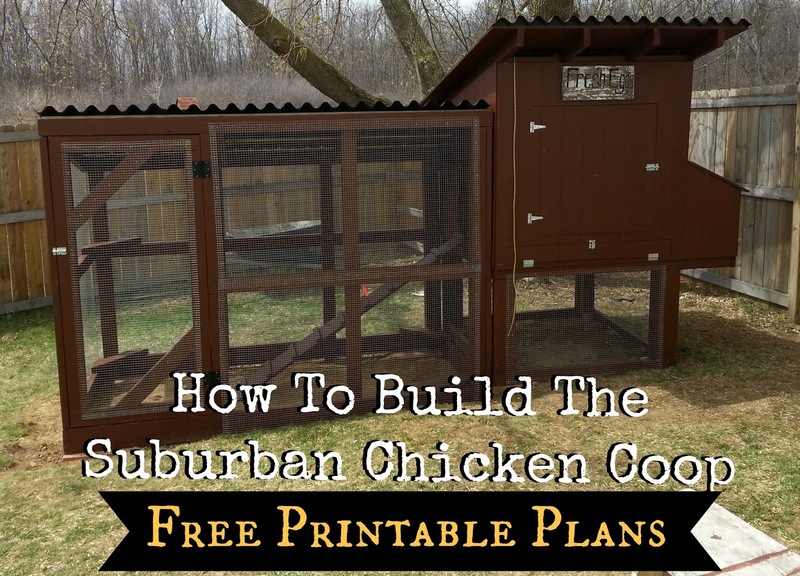 We are happy to share the journey of raising chicks and building the chicken coop with you. 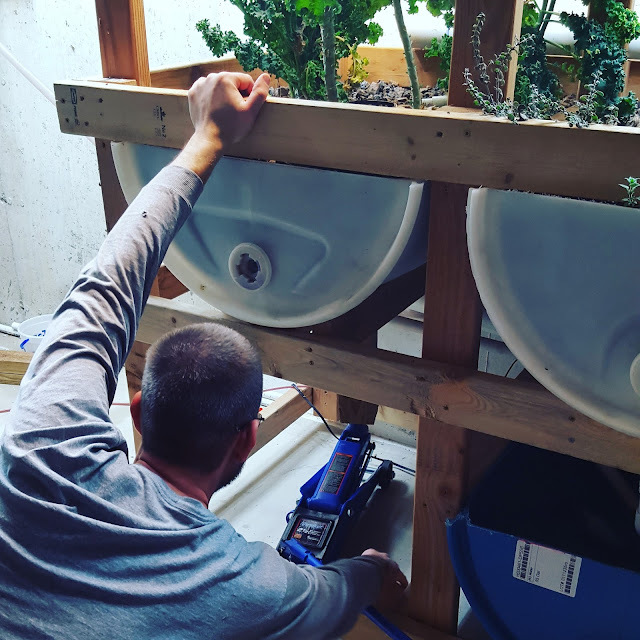 Simple Suburban Living offers a weekly aquaponics episode that highlights the saga of our indoor aquaponics gardening system. We also share our knowledge of square foot gardening and planting seeds. Our homestead is located in southeastern Michigan. 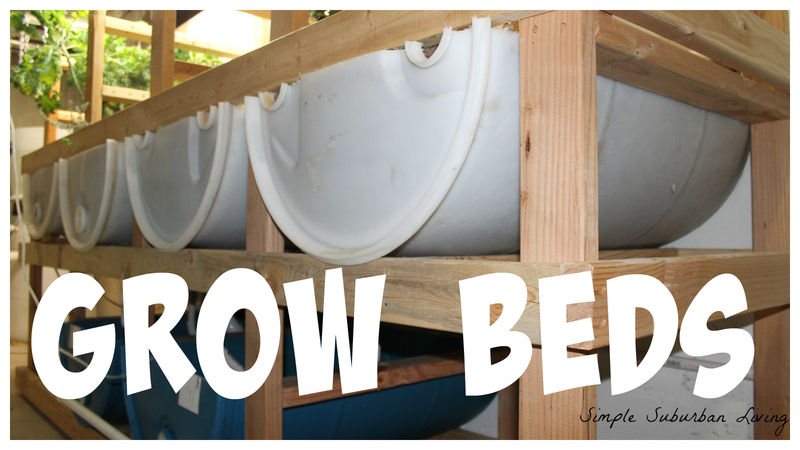 The next step in the aquaponics renovation - positioning the grow beds and lowering them as low as I can get them. Although this was not an easy process I am so glad it is done! The new height of the grow beds is 41" from the floor to the top of the framing and it is a much more comfortable working height than before. 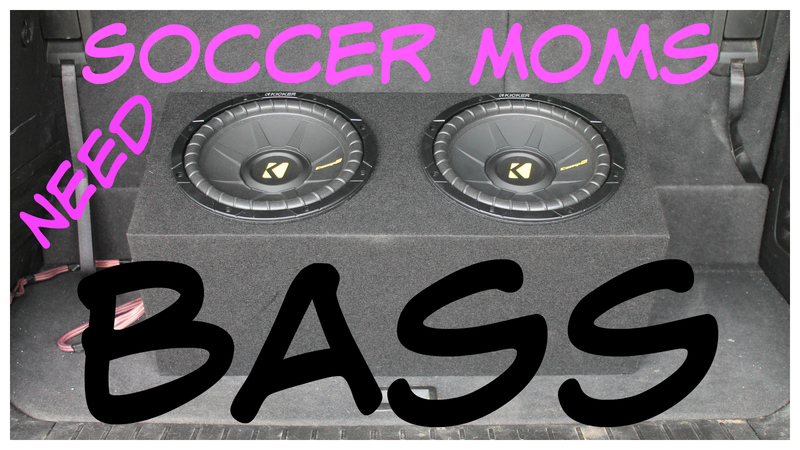 In this video I go through a very high level overview of the Kicker subwoofer installation. I am using all Kicker brand products here listed below. To see the full video on the project, click here. 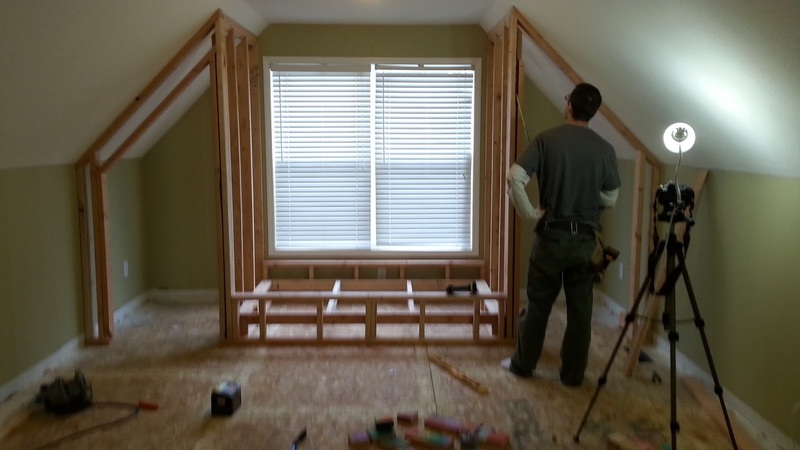 The next step in the bonus room renovation is to get these closet doors built. In a normal situation you can just run out the big box store and buy a pre-hung door. 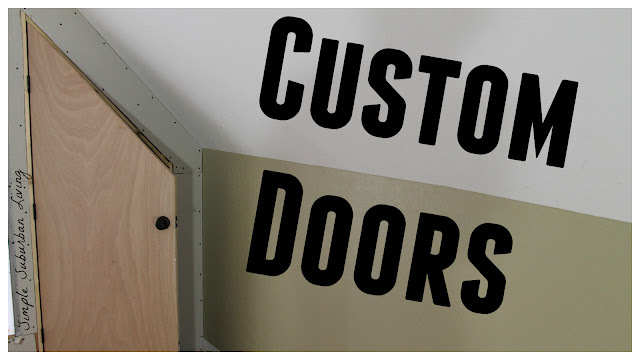 This would include the frame that just slides into your opening and with minor adjustments you have a door. Well, in the case of this bonus room I have slanted ceilings and shorter than standard opening so I need to make something custom. Here is the process that I used, right or wrong they turned out great! 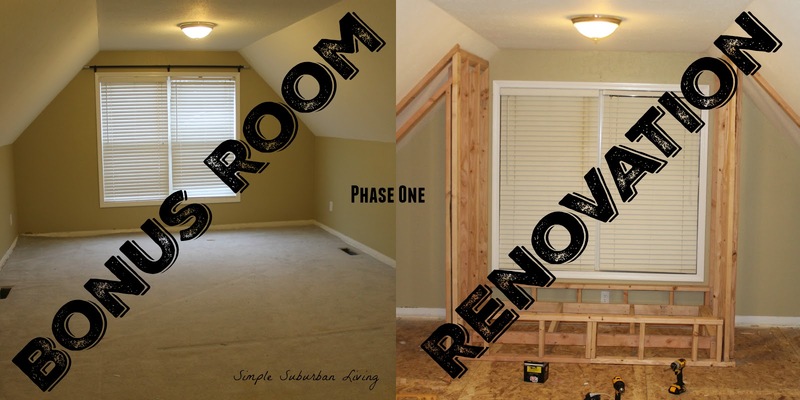 In the midst of several other projects I have pending I have started yet another project - this bonus room renovation. We have what is called a "bonus room" in our home above the garage. This is a basic multi-use room that was added during construction but does not have closets and therefore is not considered an actual bedroom. My oldest daughter has been calling this her home for the past five years and it is far past time to get her some proper closets. I started by removing the carpet and framing in an area under the window for a "daybed" and a closet on each side. The daybed will hold a regular twin mattress and be used for guests and sleep-overs. The slope of the ceiling will make it hard for the closet doors but there is just enough room for me to walk standing straight up at the tallest point. The closets will later get a custom door and shelf on the inside. The day bed is framed in so that the mattress will sit just below the front wall and below the windowsill so no one rolls out to the driveway below:) This entire area will be covered with 3/4" pine plywood I have left over from the plywood flooring project. 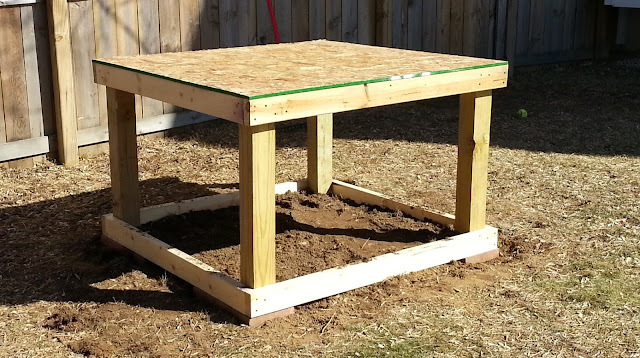 This will provide a bit more durability for the kids jumping around and climbing in and out. At this point I also did the rough electrical. I wired everything into a junction box that will be accessible from the back panel of the day bed. That is where an old receptacle used to be that will now be covered by the bed framing. I will be added one receptacle on the front wall of the bed and two lights, one in each closet. It was a nice day today so we decided to experiment with reintroducing our picked on chick to the flock. We have learned a lot about chickens and one thing is for sure - they are kind of jerks! It all started when we noticed one of our chickens was getting picked on......very badly, I mean blood bath bad. You can read more about that here. We separated her into a dog crate in the basement where we made her a little chicken "tiny house" for the time. It has now been about a month and it is time to get her back out to the coop with her sisters since she is all healed up. 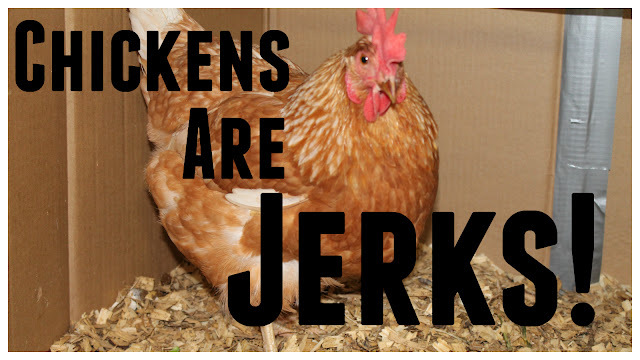 But, once a chicken has been picked on and separated from the flock it is not easy to get them back. Outsiders are not easily welcomed back and since she was being picked on before it will be even harder. Time for some experimentation. I gave "Bloody Mary" a pep talk, advised her on how to handle the situation, and decided to just put her out in an open space with the rest of the chickens and document what happens. Oh yeah, did I mentioned we have named her Bloody Mary, the kids thought Mary was a good name....Bloody Mary seems to perfect. Ok Mary ready to see daylight? 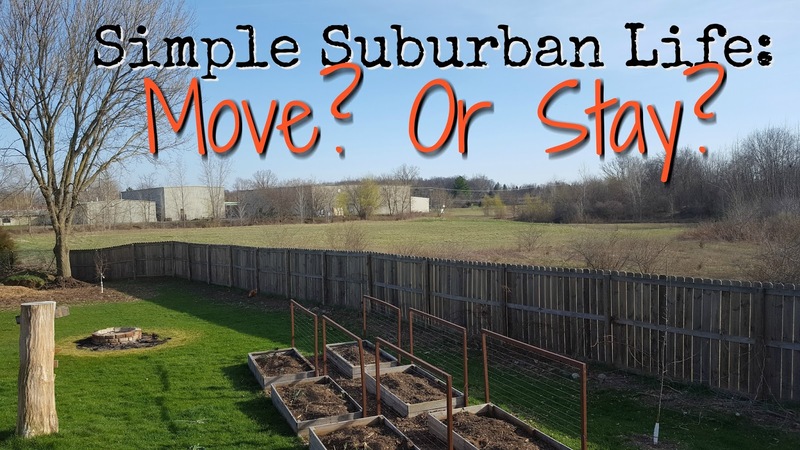 Simple Suburban Life: To Move or Not To Move? 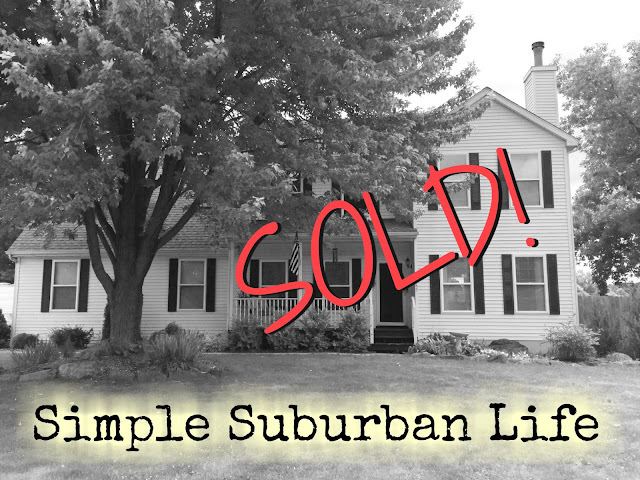 When we bought the house we live in now, I said I would never move again. Ever. I said I was going to die here. Heck, we even have a cemetery behind our property. I was sure I was going to be buried here. But that was when we were both working two fuller than full-time jobs. Back when we ate out at least three times a week and thought Hamburger Helper was a home cooked meal. Before chickens. Before gardening, composting and bread baking. Before aquaponics. Before the ache of wanting more land, more chickens, and milk goats. We have a great house, we really do. 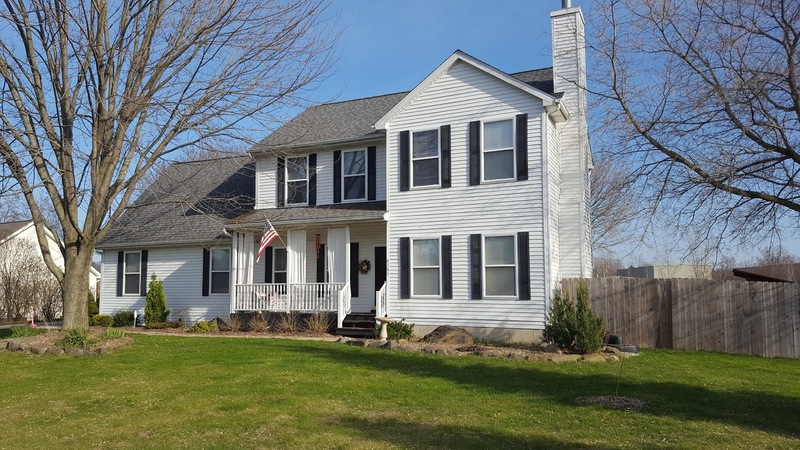 It needs a minor repair here and there, but it's structurally sound, we have great neighbors and a good size yard for a subdivision (.7 acres). It's a five minute drive to work, the school, and the gas station. 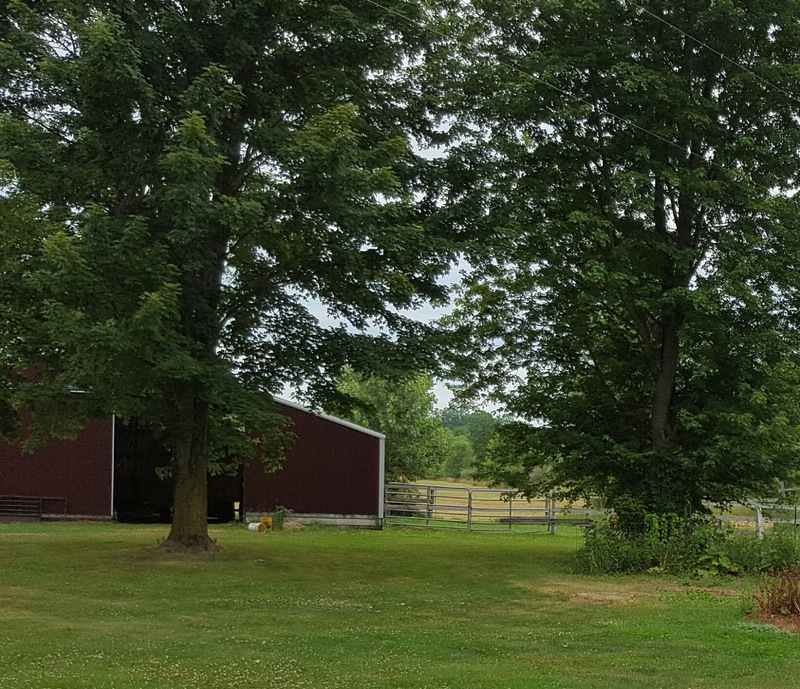 It was the perfect house for our situation back when we bought it, but our situation has changed a lot since then and we're feeling the restrictions of our tiny homestead. We want more land to grow food on and more land to feed & pasture animals on. We want to build a greenhouse, put up a windmill, and what kind of a homesteader has a tent for a barn? Pitiful. To find ourselves not knowing if we should move again is not a fun place to be in. I mean, how do we pass by fruit trees for sale and not buy them? 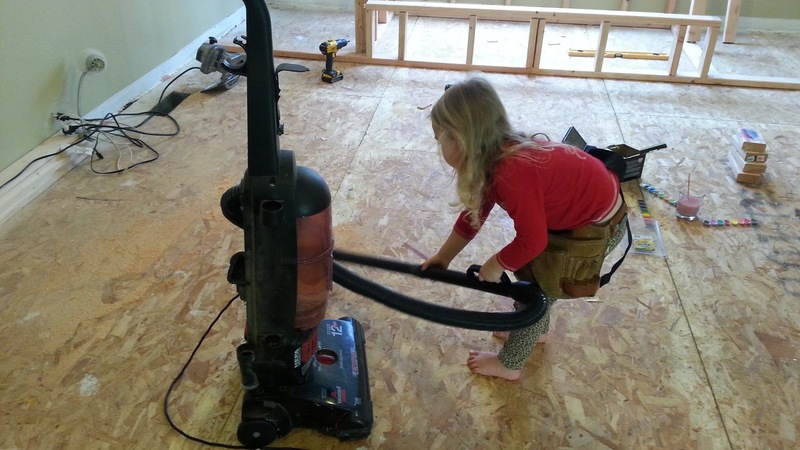 And how can I even think of renovating our kitchen if we're just going to move? What about the girls' treehouse we've been promising them? The stagnation that comes from not knowing is a bit frustrating. Another addition to the "smart home" here at the SSL Homestead and we love it! Using a smart thermostat can be a great way to control heating and cooling costs and reduce your monthly energy bills! With our intentions to get off the grid someday and eventually get Wind and solar power for our home I am always looking for ways to reduce our energy costs and save us some money! For years this has been our thermostat, boring, ugly, inefficient, and just plain no fun. This is the thermostat that came with our home and was no doubt the one installed when the home was build 27 years ago. 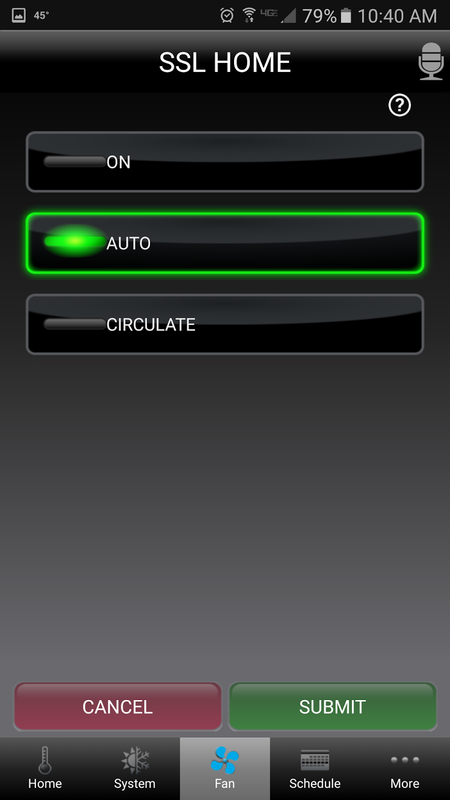 It is digital at least but has no options for scheduling temperature changes. And this.....is the new one, much nicer looking and much easier to use. Now, I know there are a lot of choices out there when looking for thermostats and also many different price options. If you are just looking fort the ability to be able to program different temps for different days of the week you can get a 7 day programmable thermostat for much cheaper. But we wanted more control; full control of the temperatures whether we were home or not home. 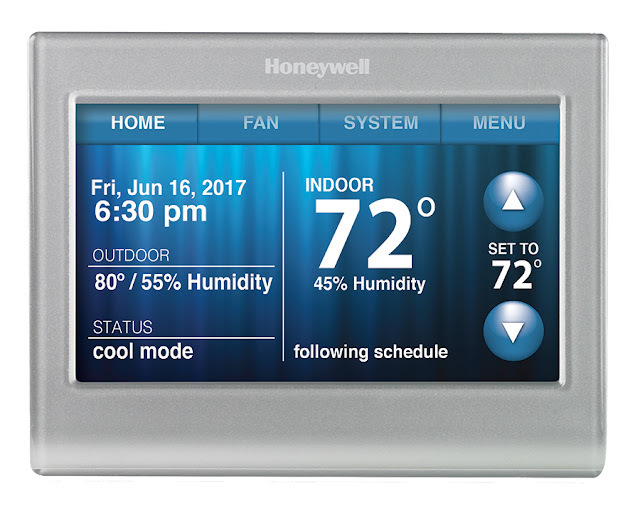 This Honeywell Smart Wifi thermostat fit the bill. 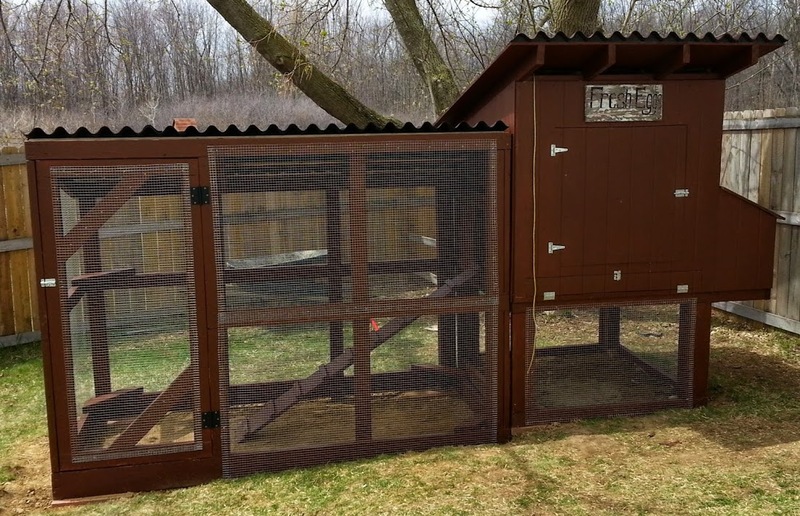 After looking at the competition (mainly Nest) we decided to go with this model, it was about $100 cheaper and met our needs. First things first, we need to get under the hood. Pop the front cover off of whatever old hideous thermostat you have. You should now see some wires, if you have just heating it might only be 2 or 3, if you have heating and AC you should see 5-7 wires depending on your setup. 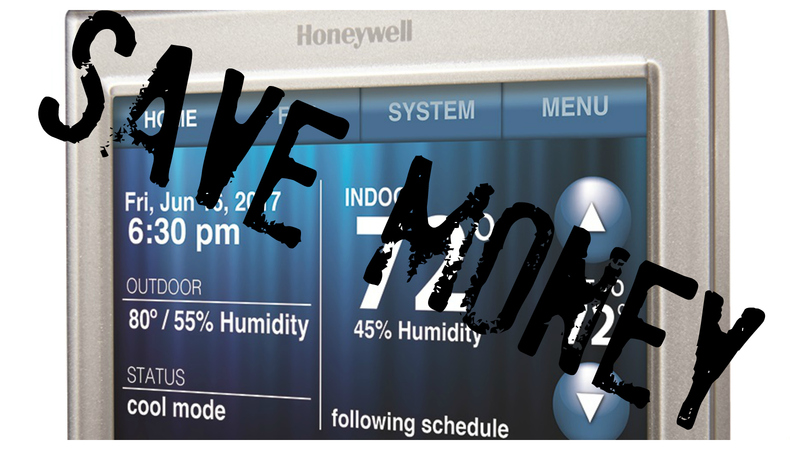 Either way, Honeywell makes this easy. They send you a bunch of stickers that match the labels on the thermostat so carefully remove each wire here using a screwdriver and then label it appropriately as you remove it. Once all of your wires have been removed and labelled go ahead and take off the entire baseplate from the wall. To watch the video of the installation please click here. Now you are ready to put on the new baseplate for the new thermostat. Just attach it using the provided screws and/or drywall anchors. 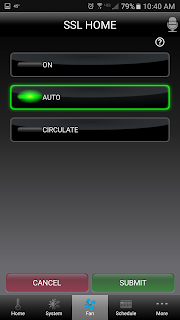 Next, connect the wires to the appropriate terminals using your labels as a guide. Each wire should line right up to a labelled terminal on the new baseplate. 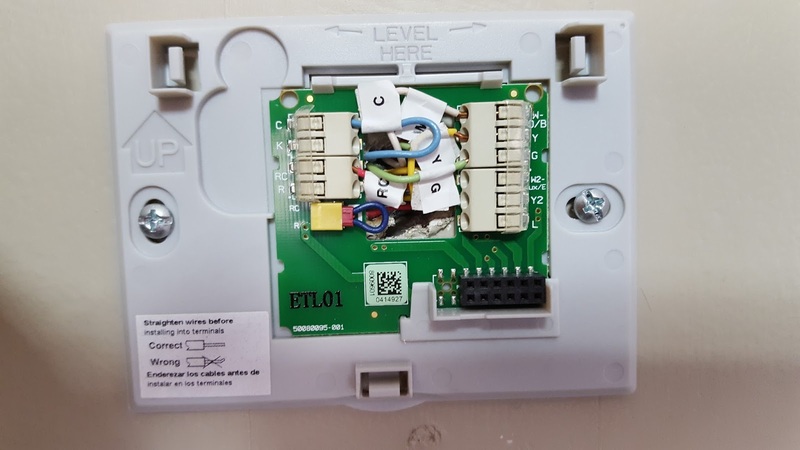 Press on the smart thermostat firmly to the baseplate until it snaps into place. 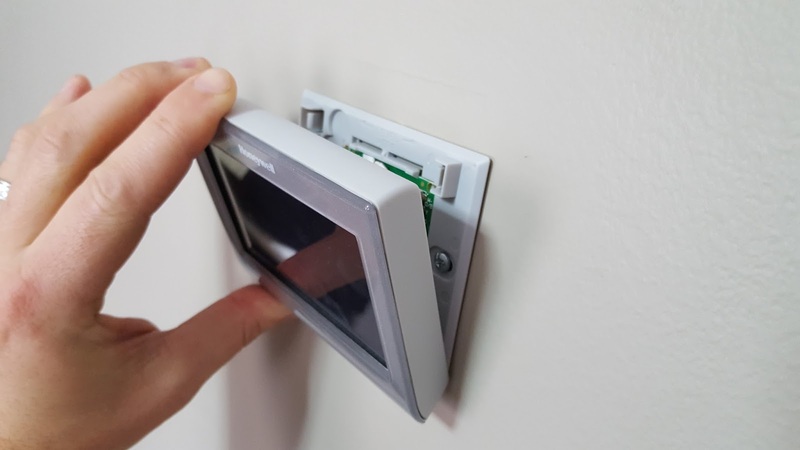 Your new thermostat is now installed! It should now power up and give you a welcome screen with some info. You can then download the app or go to a computer to setup your account. Once this is done complete the setup steps before first use of the thermostat. 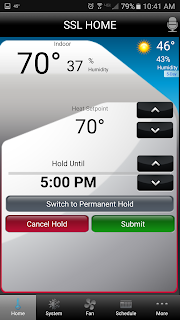 The home screen on the thermostat and the app home screen are almost the same and offer you all the main controls you will need regularly. At a glance you can see the temp inside, outside, humidity, and weather. 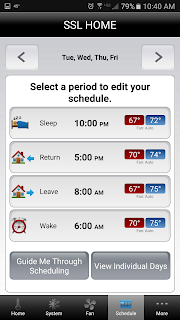 You can change the temp and deviate from your schedule if you are home on a day off or just feeling like a manual adjustment for the time. 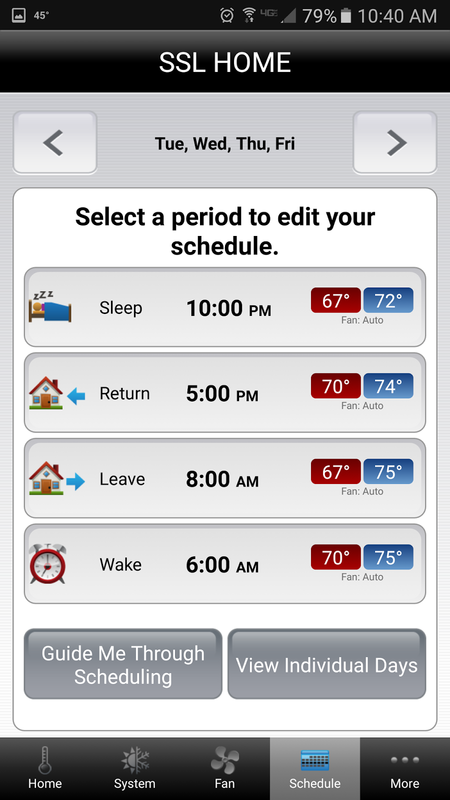 It will automatically revert back to your schedule at the next scheduled temp change time. Now my wife and I can fight over the temp in the house from our phones! We have been using this thermostat for a few months now and absolutely love it. This is an investment that will pay for itself in savings over the first 2 years easily. There are also so many other expansions in the smart home realm that work with this such as voice control through Amazon Echo and other smart products that can all work together. If you are interested in watching the full setup click here for the video. 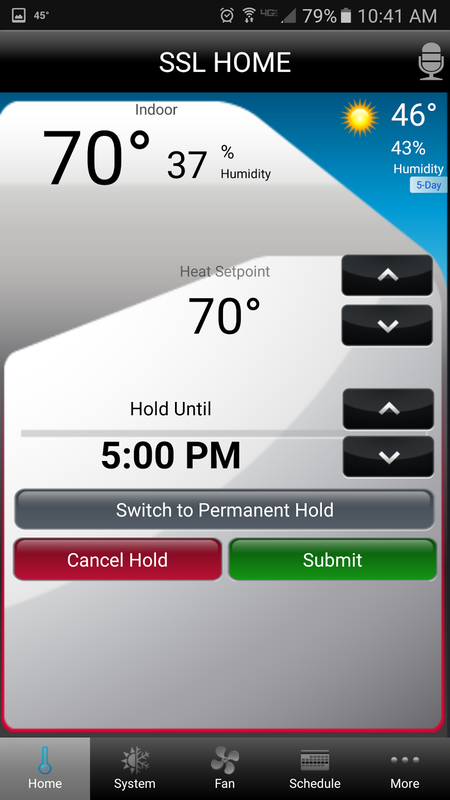 More info on the Honeywell smart thermostat here. You know him as the do-it-yourself, gardening, chicken farming, computer geek. But there are a few things about the SSL Family Dad that you may not know. He's the man of the house, literally. He's completely outnumbered by me and our three daughters. Even our dog, cats and chickens are all girls. He does a great job handling all of us, and he's not above doing a last-minute pony tail, or helping our youngest get in and out of her princess dresses ten times a day. He says he hates it, but he really loves to shop. But only at Home Depot. You see, whenever we go to one of my stores, he stands around looking like the saddest person on the planet. But send him into a Home Depot to buy a single item, and he never makes it out in under an hour. Whenever I tease him, he says he has to think about his project, and talk to the sales guy, and walk up and down every single aisle, and plan things out. That's called shopping, my dear, and you love it. He doesn't buy any clothes for himself, EVER. If he owns anything post-high school, it was either a free t-shirt from church, purchased for him by me, or given to him as a Christmas present from his mom. He also went from the Army, who provided him with everything he needed to wear, to a job at a company that provided him with uniforms, so he really never found a need to buy his own clothes. He's the lowest maintenance guy I know. If I were to sum up the SSL Family Dad in one word, it would be DEVOTED. Everything he does, he does with everything he has. He's either all in or all out once he makes up his mind. I like that about him, because I tend to be wishy washy. And after all these years, I've also never heard him tell a lie, not once, not ever. Nothing in him has the ability to be dishonest, you can count on that. It's refreshing, and an unusual quality in people these days. He's a loving, committed husband. On the days I have to work, he makes me breakfast and brings it to me while I'm getting ready. He packs our lunches, feeds the dog, signs school papers, starts my car, he's the glue that holds our house together the days when I have to work. He's the glue no matter what day it is. Even if my roses come from our local grocery store, he makes me feel like the luckiest girl in the world every morning because I get to wake up next to him. I wish every person could feel the love I feel from him. He's the best dad, period. He loves his girls and everyone knows it. They know it. He's sensitive to their emotions, but he's tough on them. And when he promises them something, he never goes back on his word. Ever. They know when he says something, he means it, and they trust him. That's huge. And holding him together at the core of who he is, is his love for the Lord. It's the reason he does everything he does. God is the reason why he loves me, loves our girls, why he's honest, trustworthy, and hardworking. No, my husband is not perfect, nor is our marriage perfect, but he strives to please the Lord everyday of his life. And that is what makes him the best catch, and the best SSL Family Dad. And his favorite team is MSU (in case you didn't already know). Phase one of the aquaponics re-design is completed! 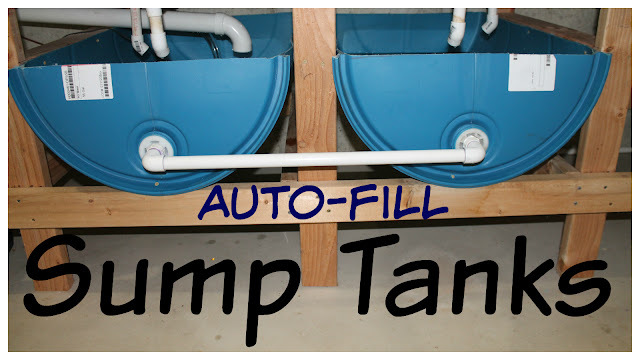 The first step of this overhaul was to move and re-design the sump tank system. I wanted to accomplish two goals - Lower the sump tanks to the lowest possible location, and also move them under the grow beds to save space and piping. So, why would I want to spend hours moving a perfectly good sump system? Well there are a couple of flaws with this design that I talked about briefly in the "tips and tricks" video. With the current setup the sump tanks are all the way to the far left standing vertically- just one 55 gallon drum on end. 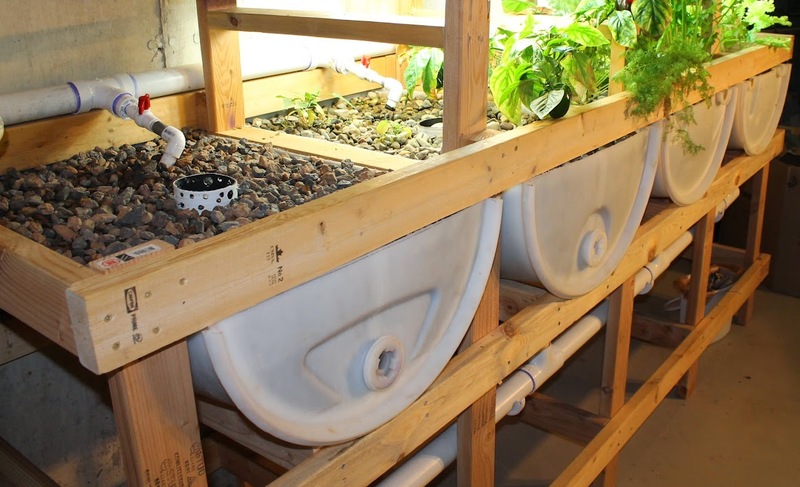 The issue I have had is that if all four grow beds decide to drain at the same time the level in the sump gets just high enough to spill small amounts of water out the large drain pipe openings. 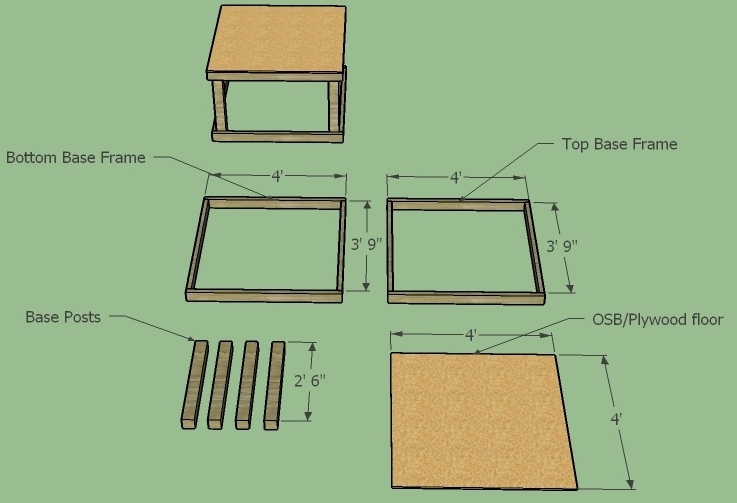 There is also a lot of wasted space under that would work perfectly for some sumps so on to the install. 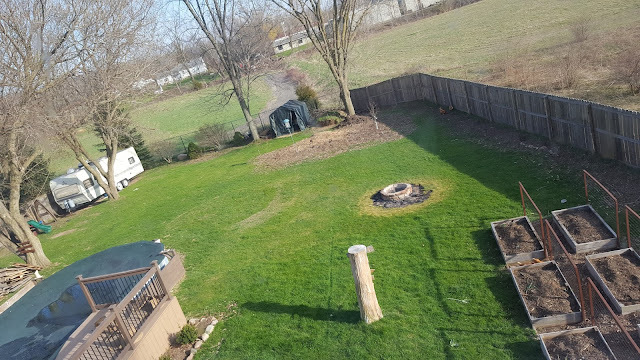 I started with a 55 gallon drum that has been cut in half. I have more on that here, but I cut it in a way that both bungs would be useable and perfectly in half. Each bung has different main threads but the inside of each cap has 3/4" threads that I can use to route water between the two halves. I removed my auto fill mechanism from the old sump tank. This auto-fill system has been working perfectly for almost two years. I love not having to add water to the system! I installed this into the side of one of the barrel halves using a small bit of silicon to seal the threads. I am using filtered water for the auto-fill as our water has too many carbonates which raises the pH in the system. During the renovation I changed the filters in our RO system which haven't been changed in over 5 years! This is the Aqueon 2300 pump, this model has been pumping with not a single issue for two years straight. That is 24/7 run time and I think I only took it apart to clean it once and it didn't really need it. I moved this over to the new sump tanks and used a temporary 3/4" flexible hose to get from the sumps to the fish tanks. I added some supports on either side of the grow bed framing legs to support the sump tanks horizontally. The sumps were inserted into the openings and screwed in with deck screws. Both halves were connected with 3/4" piping to transfer water between the two in a sense allowing them to act as one larger tank. Each grow bed has a bell siphon drain underneath that needs to be re-routed to the new sumps. I was able to remove the long drain pipe with this setup and all four beds now drain directly into the sumps. Less pipes and less to look at.